We live in a world where healthy living has become a way of life. We diet and exercise to make ourselves feel better, and we also have taken on environmental issues to make our world a cleaner and safer place to live. However, the most overlooked health issue is the air that we breathe. The Environmental Protection Agency claims that indoor air is up to 70 times more polluted than outdoor air. Now consider that most people spend between 60% to 90% of their time indoors. The facts are quite alarming. Considering that we spend so much time indoors, it makes perfect sense to clean the source of our indoor air-quality problems, the air ducts. Do You Have an Indoor Air Pollution Problem? 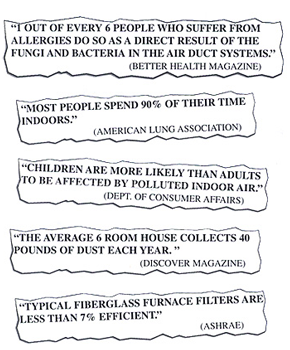 If you answer yes to any of the following questions, your home may suffer from indoor air pollution. • Do you have an air circulating system that utilizes a standard fiberglass filter? • Do you have pets? • Are there smokers in your house? • Does anyone in your house suffer from allergies, asthma, or other respiratory problems? • Do you regularly clean excessive dust accumulations from your household furniture? • Do you have dust trails or discoloring coming out of your air duct registers? • When you last changed your furnace filter, did you see dust and dirt inside the filter housing? Dirt, dust, mold pollen, and animal dander are re-circulated through our air ducts every time we turn on our heat or air-conditioner. Combine this with moisture and you have the ideal breeding ground for fungi, germs, and household mold. Studies have confirmed that some diseases, including salmonella, strep, and Legionnaires' disease, are spread by contaminated air ducts. Contact us for more information about the indoor air quality that comes from the air duct cleaning services we provide.